Happy holidays, U2 fans! 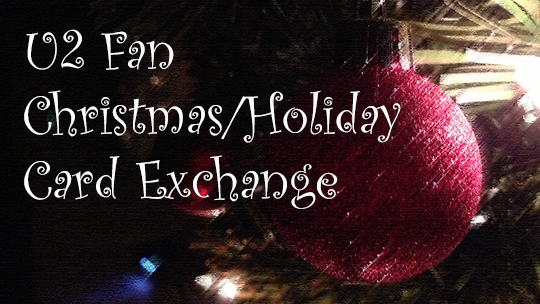 It's time for the 20th annual U2 Fan Christmas/Holiday Card Exchange -- a chance for U2 fans to send greetings of the season to other fans worldwide! Send a message to u2christmas@gmail.com and give me your postal mailing address. If you wish to participate, plan on sending at least 10 cards. In early December, I will email you the addresses of fellow U2 fans to send cards to. Please let me know by December 7th if you want to be part of the card exchange. That way there will be time for everyone's cards to get to their destinations around the world.